socket must be of watertight construction. in accordance with the operating instructions and be protected against splashed water. The connection must not be in water. by a 30 mA residual current. f Never touch the mains plug with wet hands. f Do not pull plug while operating the device. hose, trigger gun or safety devices are damaged. valve is regarded as undrinkable. f The high-pressure hose must not be damaged (danger of bursting). A damaged highpressure hose must be replaced immediately. Only use hoses and connections recommended by the manufacturer. are important for the safety of the appliance. Use only hoses, fittings and couplings recommended by the manufacturer. f Do not direct the jet against yourself or others in order to clean clothes or footwear. sprayed vapour is highly flammable, explosive and toxic. operate the unit in potentially explosive locations. f The unit must be placed on a solid base. f The gun trigger must not be jammed in position “ON” during operation. use the appliance within the range of persons unless they also wear protective clothing. been given supervision or instruction concerning use of the unit by a person responsible for their safety. while the unit is switched on. f Switch off the motor and secure the unit before transporting. 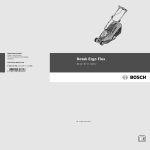 f Repairs may only be carried out by authorised Bosch Service Centres. conditions into account and be aware of other people, especially children, when operating the unit. This product should not be used for professional use. When parts are missing or damaged, please contact your dealer. 3 600 H79 0.. 3 600 H79 1.. 3 600 H79 2.. 3 600 H79 3..
See serial number 11 (rating plate) on pressure washer. is cut, damaged or entangled. (for non-EU countries 220 V, 240 V as applicable). Only use approved extension cables. Contact your Bosch Service Centre for details. earth cable of your supply network in accordance with prescribed safety regulations. and socket must be of watertight construction and intended for outdoor use. a tripping current of not more than 30 mA. Always check your RCD every time you use it. If the supply cord is damaged, it must be replaced by a Bosch Service Centre. Fix the top handle 1 to the pressure washer using screws 12. Slide detergent tank into position as shown. Join high pressure hose to gun as shown. pulling on high pressure hose. Screw inlet connector 5 onto machine water inlet connection 15.
mains water supply and machine. supply cable completely when using the pressure washer. be selected by rotating the nozzle. Rinse from top and work downwards. Turn the 4 jet-lance 7 90° anti-clockwise. Extract the 4 jet-lance. Insert the flexi-jet-lance into the power gun 8. Depress and turn the flexi-jet-lance 90° clockwise to lock in place. sensitive surfaces like cars, garden furniture etc. larger areas like patios, driveways, etc. Pencil jet – for cleaning with maximum power in smaller areas e. g. barbecues, chewing gum on patio etc. Suitable for extremely dirty surfaces. and the object being cleaned. 4 Jet-lance to low pressure fan jet mode. Read the detergent label for additional instructions. Connect the product to the mains supply ensuring that the mains switch is in the off position. Press the safety lock 10 to release the trigger 9.
the trigger safety lock 10.
trigger safety lock 10 to release the trigger 9. Fully press the trigger 9. Always wet the object first. is highly recommended for this kind of use. than 1 m below the level of the machine. is a constant flow of water. Turn off machine and connect lance. trigger 9. Press the trigger safety lock 10.
pressure hose to sharp edges or corners. Never use the roto jet mode to clean motor vehicles. f Warning: Switch off and remove plug from mains before investigating fault. and disconnect from water supply. out the following maintenance regularly. loose fixings, and worn or damaged components. and correctly fitted. Carry out necessary maintenance or repairs before using. should be carried out by an authorised customer service agent for Bosch garden products. strainer or a damaged strainer. not kink high pressure hose. Do not dispose of pressure washers into household waste! not be allowed to enter the ground, ground water or ponds, streams, etc. sprayed off to enter into the ground water. Recycle raw materials instead of waste disposal.